Auto Punditz – Page 47 – Not just another automotive website! The American giant’s best selling car in the Indian market has been the Figo. Launched just over a year back, Figo has already clinched no less than twenty different awards from various automotive publications, websites and television channels. It seems that the hard work put in by the guys at Ford has finally paid off. Before the introduction of the Ford Figo, Ford was finding it hard to mark their territory properly in the Indian market. This was a company plagued with problems like poor re-sale value, high maintenance costs, inconsistent quality etc. Their best bet was the Ikon which was doing decent numbers, especially in the taxi segment. 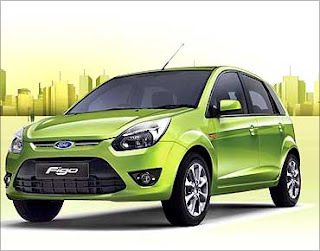 However, India being the land of hatchbacks meant Ford had to have a small car specially designed keeping in mind the needs and desires of the Indian consumers. For starters, the car looks bold yet has an under-stated appeal about it. There are enough modern design touches and this combined with a huge range of color options means there is a Figo for almost every taste. Step inside and the Figo sets a benchmark for small hatchbacks. It is not only airy but has enough room to beat most similarly priced small cars like the Maruti Estilo. The design of the console is brilliant, quality top notch and enough practical touches to keep families happy. Diesel is emerging as the common man’s favorite fuel and Ford was clever enough to make use of the same powerplant that powers the Fiesta, though in a different state of tune. It does its job pretty well in the Figo and is very fuel efficient as well. Another feather in the Figo’s cap is the way it handles in traffic. It is very nimble and the suspension is further tuned to take on Indian roads properly – something that most small cars today miss out on. Ofcourse there are a few limitations with the Figo. Being a low slung car, getting in and out for the elderly can be an issue. Even the top end variant doesn’t get rear power windows and the petrol engine is weak on both performance as well as fuel economy. However, the positives easily outweigh the negatives here and this is the reason why Ford is busy minting money with the Figo, both in India and abroad. M&M holds a majority market share (almost 40%) in the tractor industry. They also grew a stupendous 22% in terms of volumes when compared to last year. The volumes include the sales done through Swaraj divison (Punjab Tractors) which is the market leader in many parts on Northern India. Tractor division has always been one of the most profitable arm of the Mahindra Group. But they are facing stiff competition in form of John Deere & New Holland India who have tremendously revised their prices to gain volume in India. The most promising of the lot were John Deere and New Holland India which grew by about 44% and 40% respectively. Both are infusing world-class well engineered products in the Indian market, at the same time at a very competitive price. They still have a long way to go in terms of penetration in the Indian market when compared to the market leader M&M. The second biggest tractor manufacturer TAFE group had a decent growth of 17%. Its most famous brand Massey Ferguson (also the name of its partner) has tremendous brand equity among tractor buyers. Its acquisition of Eicher’s Tractor Division (way back in 2005) has also helped it grow inorganically both in terms of volumes and technology. The increase in buying power of the rural market has also led to a sustainable growth in this segment. We all are well aware that tractor divison was the only sector in automobile market which was not affected by recession. Escorts and ICML’s Sonalika tractors also had a much sustained growth of 22% & 21% respectively. These two old warhorses of the tractor industry have evolved and are striving their best to retain their market share. HMT is losing its hold and has de-grown. VST tillers have also grown by about 26%. Overall the Tractor Industry in India has grown by a healthy 24% and this number is surely bound to raise higher this fiscal. An excellent report on the outlook of the Indian Tractor Industry. Great work done by the NITIE students. I’m sure this report will enable us to extract some wonderful insights about the tractor industry in India. Bolero has been the indomitable leader in this segment. Bolero has re-instated the fact that how VALUE driven Indian market is!!! Mahindra would have never anticipated that its low cost, ingeniously manufactured SUV would drive these volumes. Bolero has proved to be an Alto in the SUV space – As Alto has been an answer to the dreams of the entry-segment car owners, similarly Bolero has succeeded to mark itself as a 6-Lakh rupee FORTUNER in rural markets of India. The product is a sure-shot success even after huge supply constraints and is bound to break all records in near future. Toyota has uncovered the vulnerability and uniqueness of the Indian market. It has proved that a major portion of the Indian market now gives more priority to Quality and Comfort rather than price. Innova has become a favorite among big families and in taxi market. Its’ premium pricing has in a way signified international standards, utmost safety and plethora of comfort. The total package has lured a lot of MPV customers and is unswerving in its performance. The mighty, muscular Scorpio raised Mahindra’s standard in the so-called premium space and has given the company a new recognition. The famous tractor manufacturer has churned and created an aspirational brand for SUV lovers. Its compactness, macho-ness, sturdy design, offroad capability and much efficient engine made it an instant hit in the Indian market. Scorpio has shown enough promise to challenge and shake-up Innova’s 2nd position. Scorpio is now the green-card for Mahindra to enter the international markets and thus expand its presence. We’ll have to see how things would fare after the launch of Force Motors SUV and the much-awaited Mahindra’s World SUV (code-named W201). Xylo’s success has suddenly threw light on this expanding MUV space and has led a path to the new launches in line (like Nissan’s NV200, Toyota Avanza, Tata Aria). Although Xylo hasn’t been able to make a significant dent in Innova’s market, rather has created a fan-following in the rural upmarket space where demand for spacious and rugged vehicle has shot up. Xylo has also constantly been trying to evolve into the taxi space and is quiet successful in doing that. Xylo in a way has been the poor man’s Innova!! It has earned a decent reputation in rural markets and the responsive engine has got it a few fans over Innova. Fortuner has created a rage and still amazes on how Toyota SUV’s have reigned over the minds & hearts of Indian buyers. Remember the equity Land Cruiser enjoys? And Fortuner has utilized this and bringing it in the 20 Lakh Rupee price point has put the sales charts on fire. Endeavour still lacks the muscle and charm that Toyota brings in its product, but has still been able to sell an average 300 no. per month. “I’ve tried out the Tata Aria and have to admit that the Tata engineers have done a great job shaping the car, The car looks magnanimous and has a wide range of features within. The 17 inch alloy wheels distinguish it as a macho roadster and the sturdy outer body shell makes it a safe car. 6 airbags, ABS with EBD & TCS tries to justify the price-point. Adapterra 4×4 transmission attempts to infuse off-roading capability and is also successful to some extent. The interiors are much plush and the multiple ac con-vents (even on the door) provides perfect cooling within the car. Multiple utility boxes on roof don’t add real value to the utilitarian purpose. With this Tata hopes to attract buyers of sedans, MUVs and SUVs. Aria can said to be a segment creater – ‘Crossover segment’. · The price Tata’s are demanding from the product is far above the ground !!! (14.5 Lacks on-road price for a Tata Monster, and that too the base variant – its too much to demand for). This removes the Aria out of the VFM proposition. · Legroom in the third row is a heart-breaker : It is totally cramped and I expected a lot more from it. Although the overall seat quality was good; I didn’t feel that it was apt for long tours/drives. · I second the point that Tata’s CV image will effect this model. People in this segment would still prefer buying a Toyota (Innova – Low End & Fortuner – High End) rather than shelving out their money on Aria. My prediction came true and Aria hasn’t been able to make impact in sales numbers. However, it would be interesting to see the performance of the upcoming 4×2 Aria (stripped version). India has traditionally been a hatchback market. Even now (Mar-11), Maruti sold around 38000 Altos’, Hyundai’s i10 sold around 14000 units. Luxury car manufacturers had always refrained from the conservative Indian market and had questioned its potential. But, time changed and so did the Indian Automobile scenario. We saw a 20-Lakh SUV (Fortuner) burn the sales chart and command a waiting period of more then 6 months. Toyota’s Fortuner has now averaged around 1000 units/month. A section of the Indian market has rapidly evolved to become luxury & brand conscious rather then price sensitive. BMW is one of the manufacturers who has rightly understood the above phenomena and hit the nail on its head. Its aggressive product and pricing policy has made it leapfrog Mercedes in terms of sales and value creation. BMW’s has again played its price vs value game with its SUV offering X1 and is reaping immediate results. The vehicle is in huge demand now and promises to set new benchmark in sales in times to come. Mercedes still stands as epitome of luxury and its loyals are undeterred by sportiness of BMW or cheekiness of Audi. C-class yet regains its leadership in the segment and gives stiff competition to its peers. Whereas 5-series proves itself to be a complete package and oversells E-class by a margin. The Rs. 50-Lakh wonders – Nissan 370 Z & Mitsubishi Evo X manages to sell 1 unit each. Volkswagen’s Beetle did an excellent 21 numbers instead of its humongous price of around Rs. 24 Lakh (on-road). But Phaeton sale was eye-popping – it did 15 no.!!! XC 60 & XC 90 did a satisfactory figure of 37 and 7 respectively. Volvo is slowly finding confidence in Indian market – this can be further re-instated with the launch of its C-class, 3-series rivaling S60 launch in India. Porsche’s much debated product Cayenne sold around 9 no.!!! Whereas other models together did around 6 no. This not only depicts Indian love for SUV’s but also signifies the value of practicality in Indian market. Overall, the sales was very encouraging and demonstrated double and triple digit growth for these luxury car manufacturers. This news is further strengthened by the arrival of super-luxury brands such as Maserati and Infinity in Indian market this April.